Scott Parazynski will discuss the challenges of going to some of the most difficult and dangerous places on and off our planet, and highlight the value that meeting these challenges brings society in terms of new innovation in healthcare and other industries. Moreover, he will discuss the importance of multidisciplinary teamwork and relentless curiosity as they relate to technology innovation. Dr. Scott Parazynski has lived and traveled all over the world, spending many of his grade school and high school years in places such as Dakar, Senegal; Beirut, Lebanon; Tehran, Iran; and Athens, Greece. A graduate of Stanford University and Stanford Medical School, he went on to train at Harvard and in Denver in preparation for a career in emergency medicine and trauma. Dr. Parazynski has numerous publications in the field of space physiology with particular expertise in human adaptation to stressful environments. In 1992 he was selected to join NASA's Astronaut Corps and eventually flew 5 Space Shuttle Missions and conducted 7 spacewalks (EVAs). In his 17 years as an Astronaut, he served in numerous senior leadership roles, including EVA Branch Chief and the Lead Astronaut for Space Shuttle Thermal Protection System Inspection & Repair (in the aftermath of the Space Shuttle Columbia tragedy). Mission highlights include a global ozone mapping mission on STS-66; leading the first joint US-Russian spacewalk during STS-86 while docked to the Russian space station Mir; serving as Senator John Glenn's crewmate and "personal physician" during STS-95; and conducting EVA assembly of the Canadian-built space station arm during STS-100. 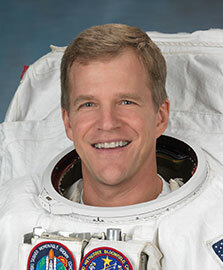 In October 2007, Dr. Parazynski led the EVA team on STS-120, a highly complex space station assembly flight, during which he performed 4 EVAs (becoming only the second astronaut to perform four EVAs on a single Space Shuttle mission). The fourth and final EVA is regarded by many as one of the most challenging and dangerous ever performed. During the EVA he was positioned by a 90-foot robotic boom farther than any orbiting astronaut had ever ventured from the safety of their airlock. During this EVA he had to repair a fully energized solar array wing. The tremendous coordinated effort in orbit and on the ground by Mission Control and other engineering experts has been likened to the Space Shuttle and Space Station era's "Apollo 13 moment." All told, Dr. Parazynski has spent over 8 weeks in space with more than 47 hours outside on spacewalks. While he has traveled over 23 million miles in orbit he has yet to earn a single frequent flyer mile! In May of 2016 Scott was inducted into the US Astronaut Hall of Fame at Kennedy Space Center, FL. In addition to being a life-long SCUBA diver and accomplished mountaineer, Scott is also a commercial, instrument, multiengine and seaplane-rated pilot with over 2,500 flight hours. He began climbing in his teens, and has climbed in the Alaska Range, the Cascades, the Rockies, the Alps, the Andes and the Himalayas. On his second attempt to scale Mt. Everest, on May 20, 2009, he became the first (and only) astronaut to stand on top of the world. Further, as part of a NASA-sponsored expedition to the high Andes, he conducted a scientific dive in the summit caldera lake of 19,700-foot Licancabur volcano, the world's highest lake. He recently served as Founding Director and Chief Medical Officer of UTMB's Center for Polar Medical Operations where he oversaw the medical screening and on-ice care of the National Science Foundation's US Antarctic Program, and was fortunate to travel widely across the most remote continent on earth. In November 2014 Dr. Scott Parazynski was designated University Explorer and Professor of Practice at Arizona State University. He is a prolific inventor and product developer, and serves on the Boards of several organizations and companies. He co-founded Blue Marble Exploration (bluemarbleexploration.com), where he serves as Chief Explorer. Blue Marble is focused on pushing human capabilities in extreme environments through technology innovation and pursuing challenging expeditions around the world. Additionally, he recently founded and serves as Managing Director of Apogee Interests, focused on commercializing his extensive innovation portfolio, including medical devices, consumer products and gear developed for extreme environments. He is the recipient of a number of prestigious awards, including: five NASA Spaceflight Medals, two NASA Distinguished Service Medals, two NASA Exceptional Service Medals, two Vladimir Komarov Diplomas from the Fédération Aéronautique Internationale, two Flight Achievement Awards from the American Astronomical Association, the Aviation Week Laureate Award, the Antarctica Service Medal, the Ellis Island Family Heritage Award, the Gold Medal from the American Institute of Polish Culture, the National Eagle Scout Association's Outstanding Eagle Award, the Order of Merit of the Republic of Poland and the Lowell Thomas Award from the Explorers Club. A Top 10 competitor in the 1988 US Olympic Luge Team trials and coach for the Philippines during the 1988 Calgary Olympic Winter Games, he was selected as a Honorary Captain of the 2010 US Olympic Luge Team for the Vancouver Games. Additionally, he a member of the Arkansas Aviation Hall of Fame and was awarded the degree of Doctor Honoris Causa from the Military University of Technology in Warsaw, Poland.